During a study break, I got back into the kitchen to whip up this much-needed caffeine fix! I hope you enjoy playing with the recipe and tweaking it to your tastes. Stevia and erythritol are my sweeteners of choice in this recipe since they’re all natural and don’t give me any side effects. Truvia would probably work in place of the erythritol and stevia.You could also try using xylitol or even Splenda in in this recipe, as long as you mix the Splenda with another sugar-free sweetener. Splenda alone doesn’t tend to sweeten chocolate-flavored treats very well. A homemade frapp works much better for a student budget than the kind from Starbucks since it costs way less per drink compared to the $3.75 for a small one. More importantly, this Healthy-cino has 74 calories and 3.2 carbs compared to the store bought version, which contains 200 calories and 42 carbs. In other words, you can be skinnier and richer drinking these bad boys. Ohhhhhh, yeah! Mix up dry ingredients. To blender or Magic Bullet cup, add crushed ice, water, half and half, and vanilla extract. Add dry mix to blender cup. Blend till smooth. Pour into mug. Enjoy! To make a single serving from the mix, add 2 Tablespoons + 1 teaspoon of the dry mix to the vanilla, ice, water, and cream listed in the original recipe. The mix makes roughly 8 servings. Play around with it and make it your own! Feel free to share your tweaks to the recipe in the comments section below. 51 Comments on My recipe for a Sugar-free, Healthy “Coffee-cino” frozen coffee drink. Move over, Starbucks! AM WONDERING IF U COULD SUB EXTRA STRONG BREWED COFFEE FOR THE WATER AND INSTANT COFFEE? Cannot wait to make this for my daughter! 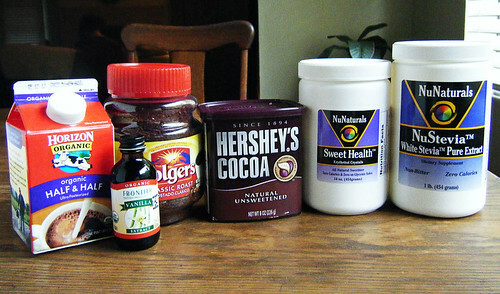 I may try the method suggested by Anonymous as those ingredients are all available. MY LC daughter has been kvetching about the price of coffee drinks on a teacher's salary. She's lost 70 lbs and deserves this treat! Will be so much fun to surprise her with it. Thank you Lauren! Tastes really good! I made the big batch and did the salt and xanthan. I also had some vanilla powder so I just a tsp of that in the big mix. One less thing to do in the am! Really great idea,I can't wait to try this. But I am just so lazy…. Looks fabulous. I MUST try this. Good to see you back. I always look forward to your recipes! Just wondering Lauren, what is the degree you are you working on? Is it something nutrition related? Poor grad students UNITE!! Good luck with physics…I could never get it. Micro was fun though except for the lab practicals!! Argh. Thanks for another wonderful recipe. Take care! I think that this will be a great challenge for you and your blogs. Delicious! I love the idea of using half and half to make it creamy – and with the lack of sugar you can use the calories for that no problem! 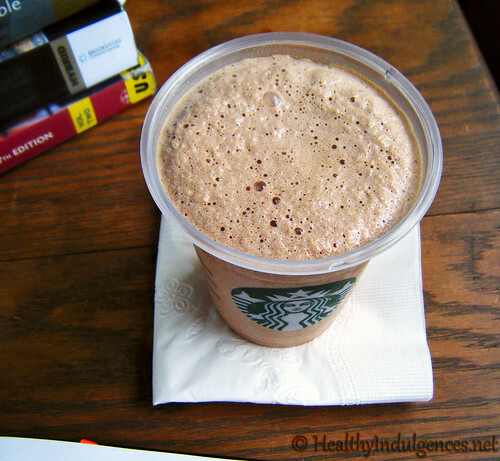 Sometimes frappes when you healthify them lose that creaminess so I love this idea! It was a hit with the husband. next time though gonna try subbing in some davinchi sf caramel syrup for the water i miss the caramel mocha mix coffe beverages i used to enjoy regularly. hopefully this tweak will be a great substitute. Blueberry cheesecake bars are n the oven and almost done. looking forward to the next recipe. Thank you Lauren! This is delicious. Already have made it two days in a row. We don't have half and half in NZ so I used full cream (yum!) Im trying to up my coconut consumption because of all the literature praising its benefits, so yesterday I put a tablespoon of dessicated coconut and a tablespoon of coconut cream in there too. It made it a filling snack. So scrumptious! Gwuinifer – It's so good to “hear” from you again, lady! <3 Have you made any pad thai lately? ;) Thanks for giving me a heads up about the freeze-dried espresso! Seems like it would be a fun ingredient to experiment with. Seneca – Glad it turned out well for you. The vanilla powder sounds like a great idea. What kind do you use? Where do you get it? Anon – I am working on a biology degree taking premed classes now after my first bachelor's. Felecia – Thank you! What kind of program are you doing? I hear you about the lab practicals! Amy – A bacon frap… now THAT is a variation I hadn't thought of! It's a low carbers dream, haha. What kind of sugar-free chips do you use? Anna – The half and half does make it rich. 🙂 For even more decadence, cream would work. I've been making it with organic whole milk in place of water lately and it's ridiculously yummy. Anon – Let me know how you like the cheesecake bars. The sugar-free syrups would be a great way to add some extra flavor. I can use up some of my eggnog Davinci's syrup this way – thanks for sharing your idea. Bethany – It's interesting to hear from international readers like you re ingredients and the changes you make. Glad the frapp worked with cream! Great texture, taste of coffee ice cream– Enjoy !! Wow this sounds amazing! Thanks for sharing! How decadent! This recipe looks like “heaven on earth”! I love to drink coffee, and this recipe will give me something different to do with my morning /afternoon cups. I want to thank you so much for posting such amazing recipes on your blog. It really does make a low carb, sugar free lifestyle a lot easier! Emma, thank you for the nice comment. Glad to see your blog is alive and well. You have lots of fun pics posted! Hey! I just came across your blog on pinterest. Looks amazing 🙂 I am also a nutrition junkie, and looove baking healthy foods. I have tried making a beet chocolate cake, that didn't turn out so well. 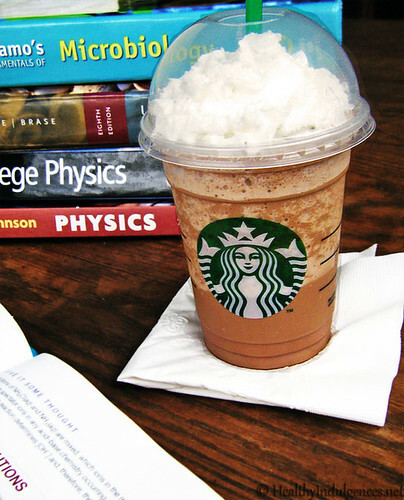 I am definitely going to be trying your bean chocolate cake, and this tasty looking mocha-frappuccinon. I have my own blog at http://www.bolsteringnutrition.blogspot.com and I have a few questions about your advertising and donation options. Not sure if you can private message on here? But facebook me, Robyn Mitchell, in High Level, Canada! If you tweak it a little (use milk instead of water, mainly, and you can leave out the coffee although I put it in and I didn't use the optional stuff), it tastes similar to what I remember of a Wendy's chocolate frosty. It's been a long time, but from memory, it was very similar. Great recipe! I still love the brownies and cheesecake recipes, too. Emma – Thank you for stopping by! Anon – Thanks for sharing your tweak that tastes like a Wendy's frosty! Yum. Maliha – Thank you for the nice comment. Thank you for this recipe! It has meant so much to me! It's my afternoon treat and enables me to have something to look forward to during the day. It's what keeps me staying 'good'! Just can't thank you enough! i thought you graduated last year? I'm planning to try a mint version of this, but I got a craving for it at 8PM. Not a good time for caffeine, so I whisked together everything except the instant coffee. Then, on an impulse, I whisked in an egg. Egg frappuchino = definite win in my book! I added a scoop of Hagen Dazs to it and it's FABULOUS! Just kidding. I did add a bit of agave nectar since I ran out of stevia, but it was wonderful. Love this recipe! Thanks for posting it. May I link it to my blog at Random Ninja – Writer of Wrongs? Hey, this was delicious. I was just wondering how if 1 tsp of erythritol has 4g carbs then how does this recipe call for 3 tsp but is only 3.2 g of carbs. Also besides being natural, regular sugar has the same amount of carbs per tsp as erythritol, so how is it better in the weight gain area? Just as part of your answer, that level of erythritol was for a mix that makes about 8 servings, so the total carbs would be divided to determine the amount in one cup, I’m assuming. Sugar is unhealthy because it suppresses the immune system, among other things, and it creates an addiction response in the brain that leads to increased sugar and carb consumption. So it’s unhealthy on a number of levels, not just because it causes the body to store fat. It would be good to research it a bit further, I hear that sweet poison is a good book, though I haven’t read it yet myself. But there are lots of reasons to avoid sugar (and artificial sweeteners, like aspartame – i would stay FAR away from those). Erica, thanks for the tip about using almond milk. I’m going to look for it at the health food store. Thanks a bunch! Is there something you can use in place of NuStevia? Something I can grab from the grocery store? Hi, Rochelle! Great question. I’m adding it to my FAQ page on sugar-free sweeteners. Maureen, glad to hear you’re digging the coffee drink. You made a paleo-cino with coconut milk – how cool! I’ll note that in the recipe directions. Thanks for the nice comment! This looks yummy – all of the “foo foo” coffee drinks always do to me, but sadly they never appeal to me much once I drink them. Black coffee for or a shot of espresso for me. My grandma, however, loves these types of drinks. I will have to make this for her because she also needs to watch her blood sugar as a diabetic. Thanks so much for sharing and linking up with Wellness Wednesday! Just found your site. Was looking for sugar free coffee frozen drink. I’m going to try your receipe. Do you any more?